Eyelashes frame your eyes, flutter every time you blink and are one of the most underrated yet important features on your face. Most girls use mascara to make them look more defined, fuller and darker ’cause after all, we all love that big doe eyed, fluttery eyelash look. Longer, more lustrous lashes make the eyes seem larger and more striking – and who doesn’t want that? Unfortunately not all of us are lucky enough to be born with naturally gorgeous long lashes. The good news? There are many home remedies out there that can work well in creating that pretty long-lashed look. There’s a huge range of eyelash growth products out there that will help you grow covetously long, thick lashes…so why should you try a humble home remedy like castor oil? Well, apart from the fact that it’ll save you a bunch of cash – castor oil has been found to be super effective when it comes getting longer, thicker eyelashes. It can also help prevent breakage and even stimulate faster, healthier eyelash growth. 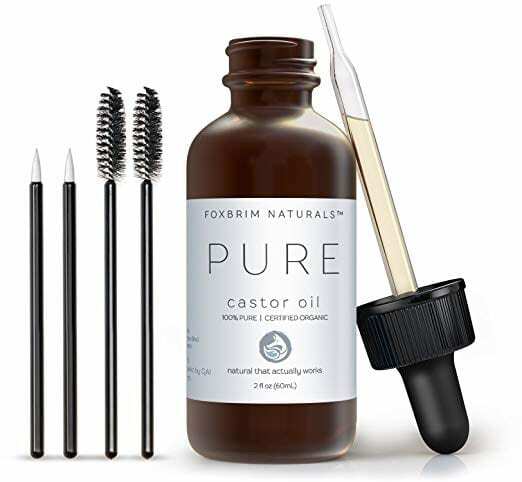 Castor oil works by moisturizing and deeply hydrating dry, brittle and tired lashes, giving them the nourishment they need to grow to their full length and height and making it easy for new lash growth to come through. That’s because castor oil is actually jammed packed with fantastic nutrients that promote natural lash growth. This thick oil is rich in fatty acids, antioxidants and proteins that help strengthen your lashes and create a naturally full lash line. By applying castor oil on eyelashes, you allow the nutrients found in castor oil to soak into your lashes and your eyelash hair follicles. The result? You can help turn dry lashes on the verge of falling out into smooth, healthy and clearly defined ones. What’s the best castor oil for eyelashes? Go organic – it’s going near your eyes so you want the purest stuff possible. Does Castor Oil Grow Eyelashes? You only need a minimal amount of castor oil for lashes – which is great as it means it will last for absolutely ages when you buy it. Invest in a disposable eyeliner brush or mascara wand to help you. If not, you can simply use a Q tip. The best time to apply castor oil on eyelashes is at night before bed since this gives you plenty of time to let the oil naturally sink into your eyelashes for maximum benefit. However it’s important to take care when applying – if the castor oil gets into your eye, it can be a bit irritating. It’s not harmful, but your vision will be blurry because of the oil so don’t use too much! Before you apply castor oil on eyelashes, make sure that your skin is really clean before you start, then gently and carefully apply the oil to just the tips of your lashes. Don’t worry about making sure you start at the roots since the oil is thick and heavy and will naturally distribute itself along your lashes during the night. Try not to touch or rub your eye to give the oil time to fully saturate into the lash and hair follicles. In the morning give your face and lashes a good clean, but remember to go easy near the delicate skin around your eyes. Castor oil is an affordable, effective home remedy if you are hoping to grow thicker, healthier eyelashes. It can strengthen your lashes and even prevent the loss of them too! Want to take natural lash growth up a notch? 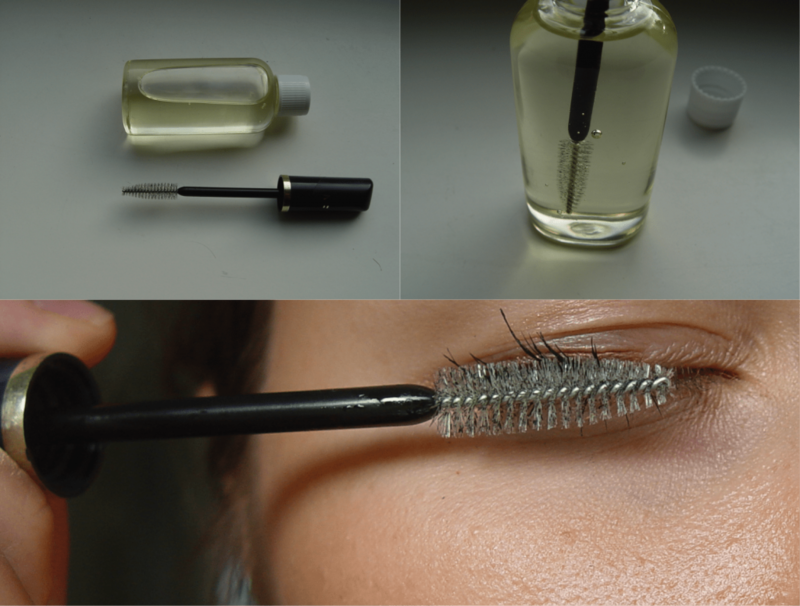 Why not make a homemade eyelash growth serum using castor oil and other lash growing ingredients? I too use Castor Oil which had the same effect at the beginning. The falling lashes subside and eventually the castor oil make you lashes growth more full and lashes get stronger. I am totally satisfied with the result and have been using it for the last 5 months. Castor oil has to be used continuously as lashes do have a natural cycle of falling out and new ones grow. You can, just make sure you cleanse the oil off thoroughly and try to use a gentle, latex and formaldehyde-free eyelash glue. I’ve used castor oil everyday for months my eyelashes still don’t grow. But my hair on my head is still growing pretty good although I still get a hand full of hair every time I comb and brush my hair. I’m in poor health and take a lot of medicine. Do to my physical limitations I can’t exercise good either. I aware that my health affects my hair growth. Still I’m hoping to find something out there that works. Is anyone else having problems like me? Debbie, please please please check out my website!! Don’t hesitate to email me with any questions and if you would like a sample to try just shoot me an address. I too am on heavy medication which resulted in poor hair and eyelash growth. Our bodies need too absorb the product and takes much much longer to see the effects of hair growth. It’s encouraging that you are experiencing head hair growth and hopefully with time you will start seeing a difference on your eye lashes. It may not be the full desired effect as everyone else but still something. I am happy with my gradual growth and plan to continue for life. Hang in there, don’t give up! Get an alternative natural doctor to do a work up on your thyroid, and eventually you may be able to rid yourself of some of the symptom treating medication. is it not harmful if it mistakenly put in eyes ? Thanks of sharing information related to eyes lashes. Can I ask…where did you find the nail polish bottle with the mascara wand? That seems really handy! That is not a nail polish bottle. I’ve always worn waterproof mascara and about a year ago I started to touch my lashes and they would feel “un-even” or clumpy and I would pick the lashes in an attempt to make them feel less clumpy and a LOT of my lashes are missing. I’ve definitely stopped picking so much, but what can I do to actually stop touching my lashes and will apply castor oil to my lashline help my lashes actually grow back? Hello Tara and thanks for stopping by! 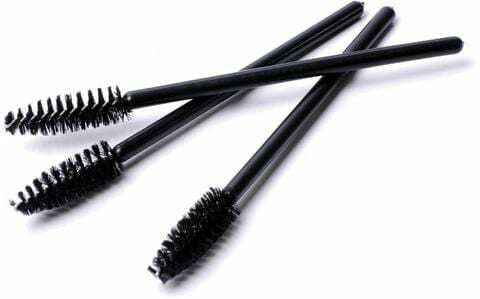 It sounds like you may have gotten into the habit of eyelash pulling, thanks to the clumpy mascara. The crappy news is that once something becomes a habit, it takes a little while to fix. The good news is that it can be fixed – on average, it takes around 66 days for a new behavior to become automatic. So you can definitely overcome this! The first thing we’d advise you to do is to stop wearing clumpy mascara. You can either go with a thinner liquid mascara to avoid clumps or a clear mascara in the daytime and then use oils (it doesn’t have to be castor – there are several natural oils great for lashes) at night to nourish your lashes. 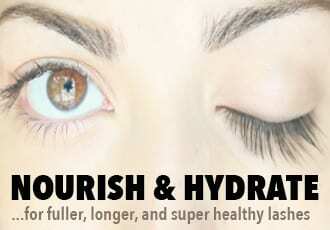 Oils don’t technically make lashes grow but they do provide nourishment and nutrients for healthier lash growth. 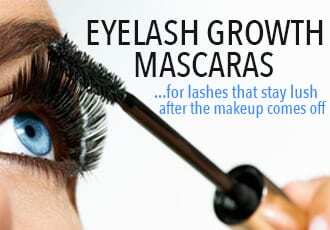 Another option is to skip mascara altogether and use falsies in the daytime or even go for lash extensions. This may help put a lid on the eyelash pulling in the same way that nail polish is used to deter nail biting. Since falsies and extensions don’t play well with oil, you can use an eyelash growth serum at night to boost your actual lash growth. In a few months, you may not even need mascara or falsies. The last tip is to maybe channel the lash pulling urge into a healthier or more harmless habit. Like, when you find your hand unconsciously moving to your lashes, instead of pulling out a lash, maybe train yourself into giving yourself a short eye massage by circling your fingers around the contour of your eyes. Or twirl your hair. Or gently pull the outer ends of your eyes. Whatever you choose, it’ll help you become aware of each time you’re tempted to pull your lashes so it’s no longer an unconscious habit. If this sounds challenging – just tell yourself that you’ll do it for just 66 days. And that your lashes are in “therapy” during that time. It’s always easier to quit a habit when you know you only have to do it for a short time. And by the end of that short time, you may be free of this pesky habit and have longer natural lashes to boot! Good luck and all the best! Another little tool – a metal eyelash comb. I’ve had one for years and would use it to comb out and declump my lashes after applying mascara (I hardly ever wear any makeup these days). I also have a plastic one with an eyebrow brush on the other side of it and that’s what I’m using right now to apply the castor oil to my lashes. I only just started with the oil so there’s nothing to see yet, but I’m hoping my lashes will come back fuller, longer and stronger than they’ve ever been. Thing is, I also sleep with an eye mask to block out any light in my room and it’s no doubt absorbing the oil. I do have another eye mask that has concave areas over the eyes so lashes don’t rub against the mask. Going to use that one from now on. I think, too, when I have the time available during the day, to apply the castor oil to my lashes for daytime as well as at night. More is more, yes? 😉 But I’ve also been applying it right at the lash line as well as the whole length of the lashes. Will stop that and just do the ends, but I think I’ll still comb it through but not be quite so fussy about getting to the roots. Those are very useful tips, as I was using the castor oil in a wrong way and my eyes have always been irritated, my vision clouded, and my nerves on the limit. ;)) Thanks, I will try once again now. 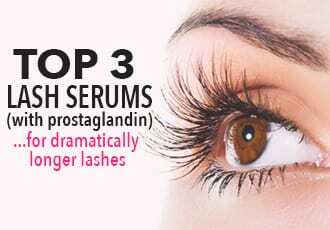 Lately I switched to modern natural serums like Cherish Lash serum, and it helped to grow my eyelashes too. But now I have your good pieces of advice. Hey Serena, thanks for stopping by! Honestly, if it didn’t work for you – why go back? Especially if you found something else that works? Is Castor oil good for your eyelashes by itself or should you mix it with coconut oil? Respectfully, I noticed a description in this article that we all want that “dopey eyed look.” I think it’s a typo that should read “doe-eyed.” Like a female deer, not a clumsy dwarf from Snow White. 🙂 It gave me a giggle. I’ve ordered castor oil and cannot wait to try it. My daughter has been using it and told me about castor oil when I complimented her on how pretty and thick and healthy her lashes looked. Lol, thanks so much for catching that – how embarrassing 🙂 Correction made and all the best luck with castor oil! So I’m using Castor Oil Usp, will that help promote growth in my eyebrows? My eyes water and burn from pollen. I started using. Castor oil and no more watering and burning. I was amazed. I started using castor oil on my eyelashes because a friend told me about it for growing more eyelashes. We are both surprised. It seems to be a barrier to the pollen that has irritated my eyes. I have tried all sorts of meds and eye drops with no success. Castor oil is like a dream come true. I don,t know if it will give me more eyelashes,but I am so thrilled it is blocking the pollen that has irritated my eyes. I love Castor Oil its helping me properly . Be sure not to rub your eyes or tug or pull on the extensions because this can cause lash loss and even damage to your natural lashes. BTW, nice tips here! Very informative. For how long I have to apply castor oil? Has anyone tried the grocery store castor oil???? I have noticed some people buy the organic black castor oil. I am starting with the kind from Walmart. Users, please give me your opinion. Could it be that some types don’t work?